Cyber security is one of the fastest-growing fields in the world, and it's one of the fastest-growing programs at Webster University. 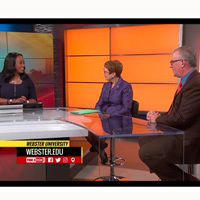 President Elizabeth (Beth) J. Stroble and assistant professor Jim Curtis were featured on Fox 2 to talk about the cybersecurity program, what to expect, and the diversity of career opportunities in the field. Watch the clip with Stroble and Curtis at Fox 2 here. The top-ranked Webster University chess team was highlighted in a feature on STL Live. Coach Susan Polgar and senior student Ray Robson were in studio for the interview, discussing their own backgrounds in chess and the experiences of Webster's four-time national champion team. Samuel Schubertappeared on Austrian National Television’s (ORF) "Zeit im Bild (ZIB) Magazin" on Monday, Sept. 12, to offer insight on the U.S. presidential elections. In the interview, he discussed Democratic candidate Hillary Clinton's bout with pneumonia and its possible impacts on her campaign, as well as the general elections. 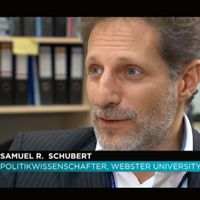 Schubert is assistant professor in the International Relations Department and interim associate director of Webster Vienna. He is an expert on U.S. foreign policy, Middle Eastern studies, terrorism and energy security.